It's Friday once again and I haven't written a blog post yet, not since my report on the Leeds Rhinos match a couple of weeks ago. This is partly because I didn't photograph any rugby last weekend as I was at a wedding. So I was really surprised and a little puzzled to discover the views to my website from Tuesday onwards had gone up significantly. Digging a little deeper into my analytics I found that most visitors were coming from the USA. Brilliant! You're all very welcome. I’m back on the sidelines of a rugby pitch on Sunday, a Rugby League match involving my local team, Keighley Cougars. Really looking forward to that. A burst of shots here but she glanced towards me on this one and it made all the difference. I did get up to some photographing last weekend though, for a charity I support: Sue Ryder. This organisation provides fantastic care for anyone suffering with life limiting illness. One of their hospices is in the village where I live and that’s the reason I got involved about four years ago. 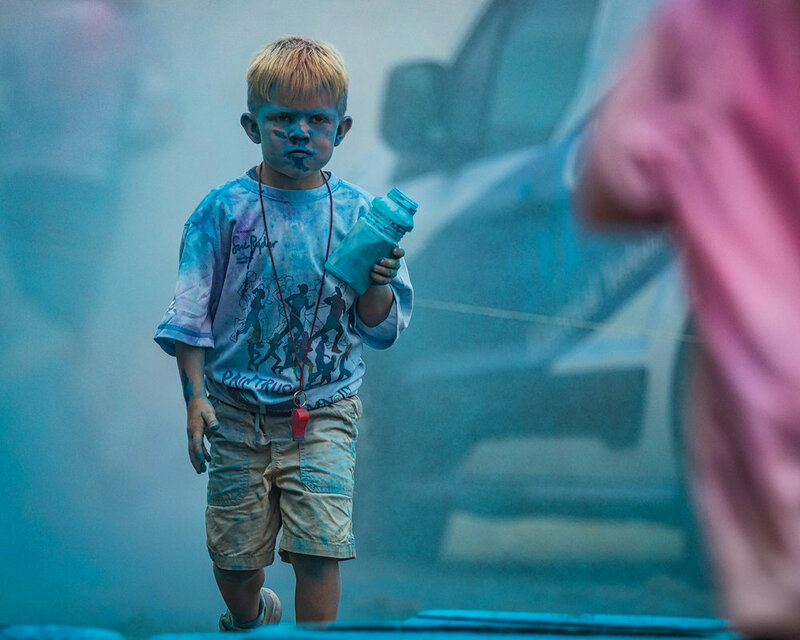 This young man was one of the paint throwing team, a job he entered into enthusiastically. Love his fierce expression! Over the years I’ve shot all kinds of activities for Sue Ryder: running, cycling, long distance swimming and many more. This is one of my favourites though - a running or walking race with special obstacles - crowds of organisers throwing powdered paint and water, a lethal combination. 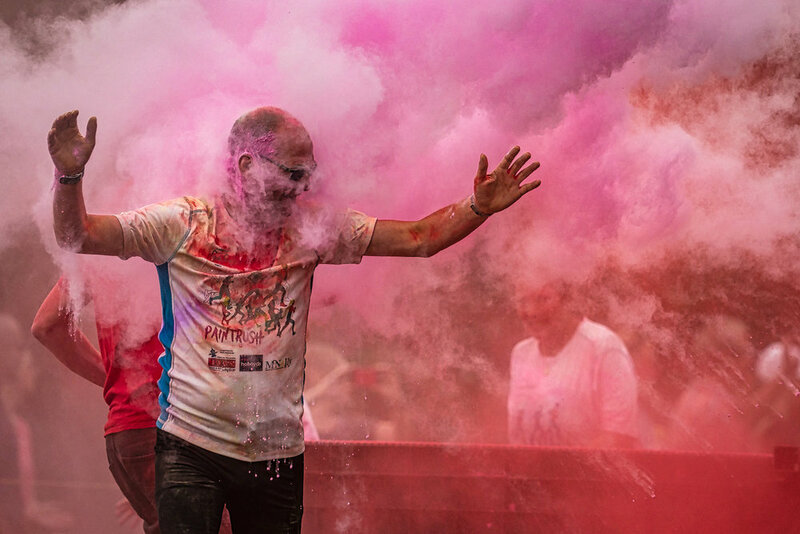 To make the event even more colourful, many competitors pour generous amounts of paint over themselves and others before the racing even begins. They call it the PaintRush. We’ve been enjoying some fantastic weather in the UK recently and the afternoon was bright and warm, great conditions. Everyone had a fantastic time and a large amount of money was raised. I certainly enjoyed myself. Powder paint and water: a devastating combination! If you’re just beginning to take action photos of any kind, helping out your local charity on their fundraising events can give you valuable experience. It helps you to learn flexibility as you often don’t know what’s going to happen, as well as how to angle and compose shots of moving people to give maximum drama. Biggest benefit is the charity will love you for it. Having a bank of photos is invaluable for their publicity, marketing and social networking. It also helps to get your name out there. Give it a go! And for the rest of you, particularly those in the UK, Sue Ryder needs to raise a huge amount each year to continue their fantastic work. They could always use a little donation. Have a great weekend.